Do you think Islam needs reform? Islam does need reform. This is critical to our national security for two reasons that bear directly on the question of which aliens should, and which should not, be allowed into our country. First, reform is essential because the broader Islamic religion includes a significant subset of Muslims who adhere to an anti-American totalitarian political ideology that demands implementation of sharia — Islamic law. This ideology and the repressive legal code on which it rests are not religion. We are not talking about the undeniably theological tenets of Islam (e.g., the oneness of Allah, the acceptance of Mohammed as the final prophet, and the Koran as Allah’s revelation). We are talking about a framework for the political organization of the state, and about the implementation of a legal corpus that is blatantly discriminatory, hostile to liberty, and — in its prescriptions of crime and punishment — cruel. Islam must reform so that this totalitarian political ideology, sharia supremacism (or, if you prefer, “radical Islam”), is expressly severable from Islam’s truly religious tenets. To fashion an immigration policy that serves our vital national-security interests without violating our commitment to religious liberty, we must be able to exclude sharia supremacists while admitting Muslims who reject sharia supremacism and would be loyal to the Constitution. 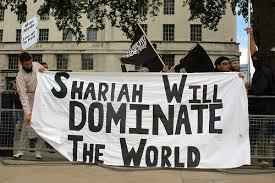 Second, sharia supremacists are acting on a “voluntary apartheid” strategy of gradual conquest. You needn’t take my word for it. Influential sharia supremacists encourage Muslims of the Middle East and North Africa to integrate into Western societies without assimilating Western culture. The renowned Muslim Brotherhood jurist Sheikh Yusuf al-Qaradawi, who vows that “Islam will conquer Europe, conquer America,” urges Muslim migrants to demand the right to live in accordance with sharia. Turkey’s sharia-supremacist president, Recep Tayyip Erdogan, admonishes that pressuring Muslims to assimilate is “a crime against humanity.” The Organisation of Islamic Cooperation, a bloc of 57 Muslim governments that purports to speak as a quasi-caliphate, promulgated its “Declaration of Human Rights in Islam” in 1990 — precisely because what the United Nations in 1948 presumptuously called the Universal Declaration of Human Rights is neither “universal” nor suitable to a sharia culture. Voluntary apartheid does not require insinuating terrorists into migrant populations. It requires insinuating assimilation-resistant migrant populations into Western countries. Those populations form sharia-supremacist enclaves, which (a) demand the autonomy to conduct their affairs under Islamic law as a challenge to the sovereign authority of the host country and (b) become safe havens for incitement, radicalization, paramilitary training, fundraising, and jihadist conspiracy — the prerequisites for terrorism. Comment: Frankly the integration of Shariah Law with Islam is so tight, I'm not sure Islam can reform.